Who doesn’t enjoy quinoa? A perfect protein that doubles as a comfort food, I think it’s a food that can’t be beat! So when stuffed peppers sounded like the perfect supper idea, I decided to play around a bit with the recipe and it’s become a meal that we all love and no one complains about being hungry 20 minutes after we eat. And in a home where my children eat like hobbits, anything that fills them up is a success! This recipe is different in that the sauce is more like a Sloppy Joe, but it’s comforting and is a quick, week-night supper. The filling freezes well and can be pulled out to stuff peppers whenever you happen on a good harvest! Cook the quinoa while you brown the meat. Add in the remaining ingredients (except the cheese) and cook until the meat is done and the onions tender. 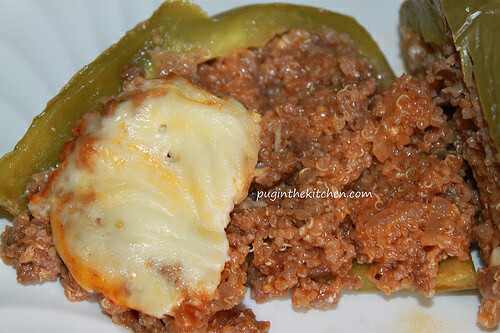 Chop the tops off the peppers and spoon the the filling. Use the pepper tops as a snack for your 3 year old who is, by this time, starving. Place a slice of cheese on top of each pepper. Bake the peppers at 350 degrees for 30 minutes and the cheese is bubbly and brown.